The three key components of a national reconciliation process are truth, justice, and reconciliation. History has shown that all three should be properly addressed for a transition from a repressive regime to take place successfully, that is, in a way that allows society to heal and integrate a painful past in a productive manner. The Cuban process, we believe, is inevitable and will hopefully begin sooner rather than later. Whether it’s tomorrow, next year, or 5-10 years from now, the Cuban people will, in an open society, no doubt have to confront the violence, loss, and trauma of the last half-century. Cuba is not there yet. Until the time for a transition process begins, we can only lay foundations to undertake then each of these three challenges responsibly. In the last 25 years, there have been at least twenty processes worldwide generally known as Truth and Justice or Truth and Reconciliation Commissions. This trend began in the early 1980s in Argentina after the end of its military rule and extended to Uruguay, Chad, Brazil, Chile, El Salvador, Guatemala, Germany, South Africa, and so on. There is a definitive movement of growing international awareness of the value, need, and use of this tool to face the challenges of transition from violent dictatorships to democracy, which is also a worldwide trend. This has generated a wealth of experience in facing the past, ample and lively intellectual debate regarding all its aspects—intellectual, psychological and practical— and vivid awareness of the huge individual and collective challenges that this process implies. This lets us draw from a vast literature and practical knowhow that will one day help us face our unique history and develop our own path to overcoming what many believe to be the darkest chapter of our national history. On this occasion, we will deal briefly with the issue of truth. Due to a series of events we cannot relate here, in 1998 the authors embarked on a partnership of common purpose with this project, which we came to call Truth Recovery Archive on Cuba (T.R.A.C.). Over time, a handful of supporters have believed in this work, but our resources are minimal and the work is entirely voluntary. What really sustains this project is the conviction that uncovering the truth is not only necessary, but, importantly, constitutes a debt with those who’ve lost their lives and their loved ones. In addition it is essential to present and future generations. Despite tremendous challenges, for six years one of the authors (Armando Lago) has worked line by line, page by page, composing a volume of over 1,000 pages drawn from a massive bibliography that crossreferences and pulls together thousands of sources to give a name and a story to the victims of the political process we know as the Cuban Revolution. This work is to be published in a forthcoming volume titled The Human Cost of Social Revolution: The Black Book of Cuban Communism. His research is the starting point for the other aspects of this project, which: 1) seeks to organize the assembled information in a database and other useful ways in order to disseminate it through a website, reports, documentaries, and other forms; and 2) attempts to create an archive to expand on each documented case by gathering evidence, pictures, testimonies, etc., to tell each story as fully as possible. The scope of the project is the loss of life attributed to political-military causes from Batista’s March 10, 1952 coup d’etat onwards. It encompasses actions taking place inside or outside the island and affecting Cubans and non-Cubans alike. Abundant sources have been used for this research: existing lists, press reports, prison memoirs, personal testimonies, and others. Each name is documented with the source of the information. Tables 1 and 2 provide a few snapshots into this groundbreaking work. 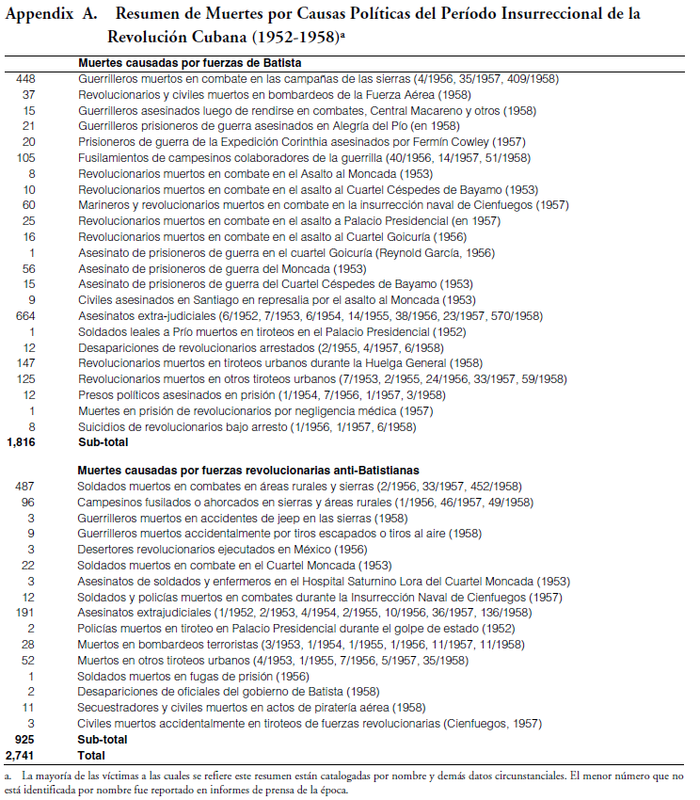 In addition to the 102,794 victims of the Castro Regime (Table 1), we have documentation of 191 extra-judicial assassinations committed by anti-Castro groups or individuals and 2,739 losses by Castro forces in combat at Escambray and Bay of Pigs and in infiltration raids. These numbers, however, do not include work that has not been done yet—deaths of foreign nationals resulting from international incursions, sabotage, or support for subversion outside of Cuba, sponsored and/or funded by Cuba or with Cuban participation. If we are ever able to embark on documenting this, numbers will total in the thousands in Central and South America alone, not to mention Africa. In addition, we have documented 2,741 reported deaths for the Batista period (from Batista’s March 10, 1952 coup d’etat to Castro’s takeover on January 1, 1959). 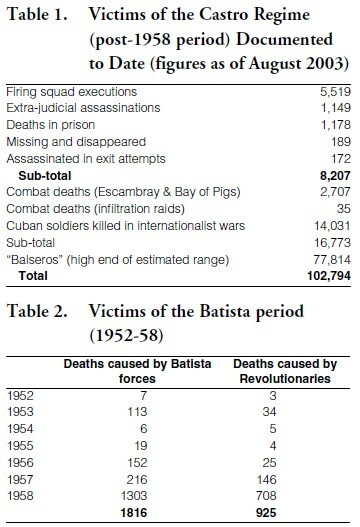 Of these, 1,807 deaths were caused by Batista’s forces and 912 deaths by revolutionary elements. The Appendix provides more detail on these summary figures. Actually, each case is substantiated with the name and circumstances of death. It is important to take into account, however, that this is work in progress, and therefore the numbers change as names are added and errors corrected. Because the criteria for inclusion are quite strict and we lack access to the island for field research, we believe these numbers do not reflect the true dimension of loss of life. Just to give one example: several persons in Cuba or who have left Cuba in recent years and are familiar with the situation inside some prisons have given anecdotal accounts of prisoners who have died for lack of medical attention or have committed suicide as a result of the awful conditions they faced. Most of these victims cannot be accounted for yet for lack of adequate information. There are many other challenges with respect to the research and classification of deaths, which we cannot detail here. The reality is that until Cuba is free and this work can be done inside the island—hopefully as part of a state sponsored effort—many of these deficiencies will not be properly addressed and corrected. And even then, the work will never be flawless, as has been seen in other countries. Although the forthcoming book by Lago is quite comprehensive, we intend to continue documenting cases as they happen or as reports and evidence of past victims surface. WHAT ARE THE REASONS FOR OUR EFFORT? There are several motives behind this project. First, to raise awareness—both inside Cuba and around the world—of individual and collective human suffering and of the magnitude of the Cuban tragedy, hoping to generate international pressure to help put a stop to the continued loss of life and to other human rights abuses, all with the purpose of helping bring about the end of the Castro regime. This compelling motivating factor exists independently from the desire to establish truth with the eventual goal of national reconciliation. To us, it seems logical that the path to reconciliation means that, first, we must work to end the cause of violence. To put these numbers in the context of an experience close in time and space, the Pinochet regime in Chile has been documented officially as having killed or disappeared 3,197 people (2,095 extra-judicial executions and deaths under torture and 1,102 disappearances). Think about the worldwide condemnation of the Pinochet regime and imagine the impact the facts about the magnitude of the Cuban tragedy could have if they were better known, in particular ways—through testimony about its victims—and in a general way—by presenting information about its scale. Fidel Castro and the Cuban leadership have traveled the world with impunity, and wined and dined with figures of international prominence without shame or fear. We believe they must be held accountable. The record of their crimes is the first step to making that possible. Second, to help, in a way, to make sense of the countless stories of loss and sacrifice and, in a small way, honor the memory of those who died seeking or defending freedom. Third, to sensitize the Cuban people about the huge cost of this national tragedy and the importance of resolving conflicts peacefully and democratically, so historic mistakes and injustices are not repeated. We believe that truth is the most solid foundation to embrace forgiveness and achieve true reconciliation. We count all victims—regardless of race, social or economic status, nationality or political affiliations or ideological belief. Our duty is to the facts. Let us very briefly address several key issues we have learned from truth and reconciliation processes worldwide. This cursory selection summarizes some of the challenges ahead of us. Should we know and remember or should we move on? Tuth is healing—at an individual and collective level, it is psychologically restoring to victims, survivors, and society as a whole. Knowledge and official acknowledgement of some sort are required for the healing to begin. Mental health professionals can well attest to the fact that mourning without knowledge of the facts is more painful and prolonged. Closure eases the burden of grief and helps us move forward. Whatever the arguments, let us keep in mind that forgetting cannot be decreed. If it is established that we ought to embark on a process that includes remembering, how do we do that? The strategies adopted to deal with the past are necessarily shaped by the existing political and social context and should be creative while carefully thought out. Informal processes, such as the one conducted in Guatemala through the Catholic Church, have taken place, but there is growing consensus of the imperative of remembering “officially,” that is, through some official body created by the government for this purpose that will create an official record. The implications and pragmatic realities that will need to be resolved are enormous. Societies must deal not only with the practical aspects of compensating victims, but also with moral questions of whether to trade justice for truth and how to deal with informers, accomplices, and even neighbors who remained silent. • What defines a victim? For example, overemphasizing victims who lost their lives may underemphasize the high cost paid by their surviving family members, including violence they may have suffered directly of indirectly. Should emotional suffering be taken as a basis for compensation? • What abuses should be taken into account? For example, South Africa’s Truth and Reconciliation Commission dealt with a broad category of “gross human rights violations,” while the Chilean commission dealt only with deaths and disappearances. • Who should be appointed to carry out the process? What powers shall they have? Will they be seen as credible and impartial? If seen as biased, how will that affect the process? All of these questions raise issues of methodology, delivery of justice, forgiveness, the successful managing of legitimate rage, addressing demands for justice and desire for revenge, political implications, role of institutions society (for example, should the Catholic Church play a role? ), and so on. How do we deal with the abusers, those who committed the crimes or gave the orders? This involves considering remedies from blanket amnesties to trials and actual convictions of perpetrators. In order to get perpetrators to provide information, should justice be exchanged for truth? Who gets blamed or punished—from foot soldiers to commanders—must be addressed. In East Germany, for example, the trials of border guards have provoked huge debates regarding what responsibility individuals following orders have and how should they be punished vis-à-vis the officials who directed the very system that stopped people from leaving. In Chile, after several years of amnesties granted during the transition to democracy, deals made with the Pinochet government have been overturned and perpetrators sentenced. In the Cuban case, the length of time of some of the crimes could potentially impact how certain decisions are taken. For example, many of the executions took place up to 43 years ago. Many of the perpetrators, if still alive, are in their seventies. A sentence would mean that they would spend the rest of their lives in prison. Should a minimum sentence be applied? Should elderly or infirm people be amnestied? All of these questions will need to be addressed. It is important to point out that there is a definite trend in world conscience, in international law— both customary and written—as well as in the actual practice of the delivery of justice worldwide, to address past wrongs, provide reparation, and bring perpetrators to justice. This permeates across a wide spectrum, from the billion-dollar settlement of German companies to compensate victims of slave labor, to the freezing and return of funds stolen by government leaders and stashed away in Swiss banks, and to the restoration to their rightful owners of art work stolen during World War II. How do we legitimize the remembering process? How do we provide reparation? This brings up such issues as acknowledgement, apology, compensation, expectation on the victims and survivors to cooperate and to forgive or, rather, to demand justice, sensitivity to victims and survivors from the commission members, the media, and society in general. The psychological, economic, and political implications are obvious. It is important for these processes to include recommendations to protect human rights and ensure political and social reform that will provide assurance that past crimes will be avoided in the future and that society will be transformed. This can be done through education programs, human rights awareness campaigns, victim support systems, and the creation of forward-looking structures. There is considerable evidence to suggest that it is through taking control of “memory and history” that societies can develop a constructive collective memory to deal positively and successfully with periods that follow trauma and violence. It is crucial for society as a whole participate in an extensive preparation and consultative process to determine what strategy is best and carefully define the process to be undertaken. We firmly believe that only when Cuba is a free country and when Cuban society can, as a whole, participate fully in an entirely informed and open manner, that all of these questions can be resolved with fairness and over time to allow true societal healing. The work ahead is enormous. We can begin by setting the tone for when circumstances are right, but we must recognize that this will be an imperfect process, fraught with limitations, dissatisfactions, disagreements, mishaps, and imperfections. No society has escaped that. Finally, we believe that for this process to be healing and allow us to move forward successfully, we should prepare to courageously confront its challenges head on and address its full complexities with great attention to fairness, integrity, and, ideally, with great doses of compassion. 1. The presentation of the paper was made by María C. Werlau. The paper borrows heavily from remarks delivered at the conference “The State, Justice and the Rule of Law in Cuba on the Centennial of the First Republican Constitution,” hosted by St. Thomas University, Miami, May 11-12, 2001.